This is a Vintage pillow tutorial, but you could use this technique with new fabric as well. This pillow was so fun to make. I cut a piece of fabric that was hand embroidered for the front of the pillow. It was not quite big enough so I cut piece of fabric to mount the embroidery to. Then I cut a top and bottom piece for the back. I hemmed one end for the top back and one end for the bottom back. 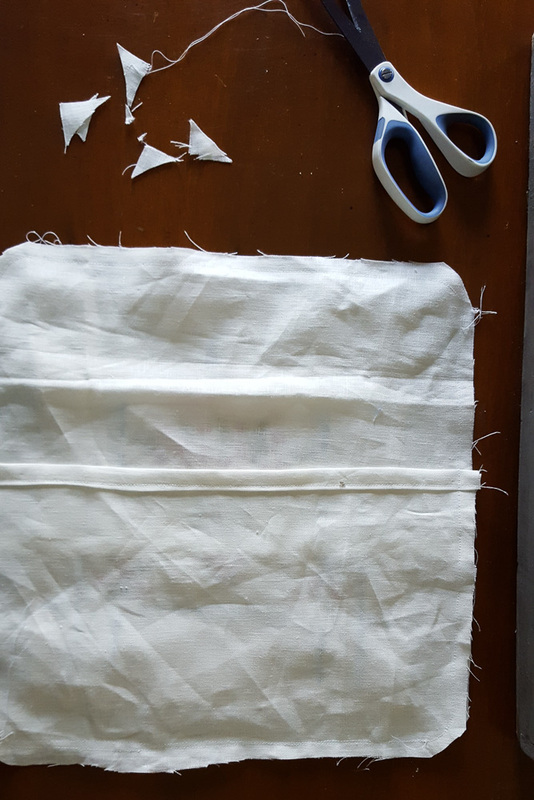 First I pressed the seams, then did the sewing. 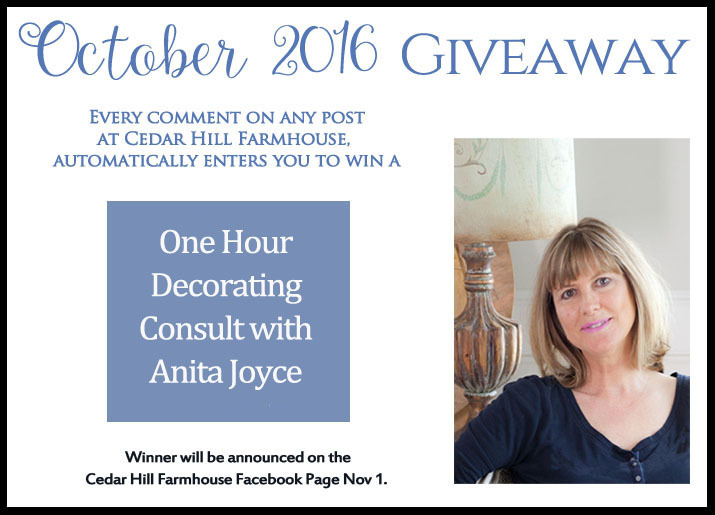 Don’t forget every time you leave a comment on any post at the Cedar Hill Farmhouse blog during October, you are automatically entered to win my giveaway. Details here. Next I pinned the embroidery work to the front piece. After I sewed it in place, I removed the pins. I placed the front right side up. then placed the upper back on top. Then placed the lower back on last. I pinned it, then sewed the pieces to together. Then turned it right side out and inserted the pillow form. That was a very fast project. I noticed there was a pulled piece of blue embroidery thread, so I pulled that piece over to the back. And I put it in my blue check French chair in my study. I really like it. Using old vintage pieces like this can give you a very custom feel. You’ll have pillows nobody else has. It’s fun and super easy. This pillow is so cute! I have several of my grandmother’s dresser scarves. I will have to try this project. Thank you for the great idea. Always wondered what to do with the pretty pillowcases that were handed down. So lovely! Thank you for the tutorial. I love repurposing old linens. There are so many ways to give them new life. 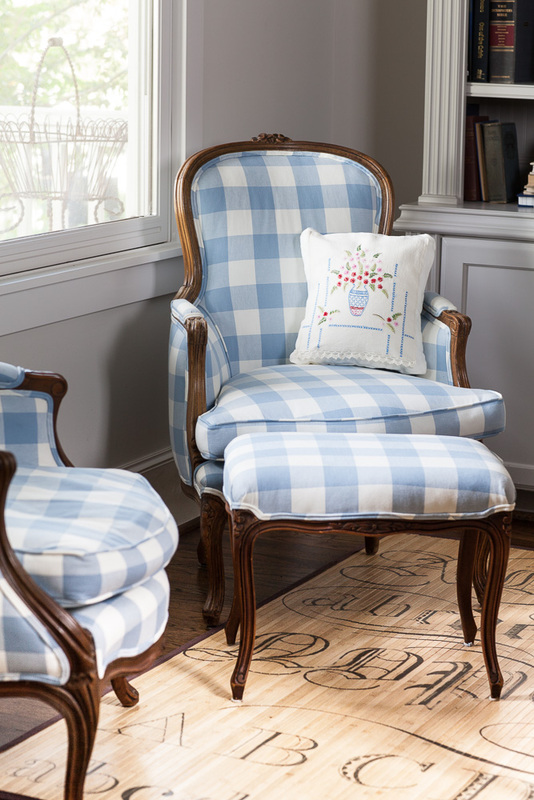 This pillow is the perfect touch in your blue checked chair. Thank you for sharing! It would be fun to do this for holiday pillows, too! Thank you, Anita. I collect old linens and some of them are stained. This is a perfect way to use them! Pretty. I found a monogram hand towel I used for a pillow. Nice. Simple enough for even someone who dosen’t sew much. love the happy colors in the pillow! It was a good reminder that if something doesn’t “fit” there are ways to make it work! Thank you for the tutorial. 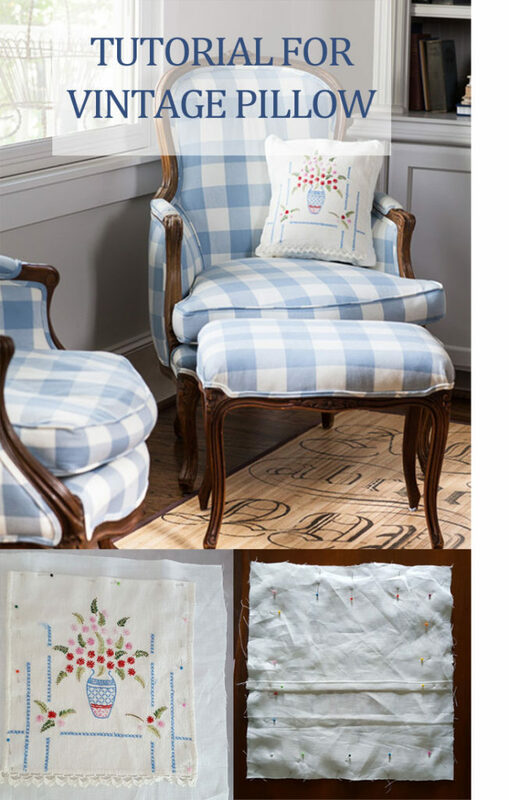 I would love to try this using some of the vintage linens I received from my mother-in-law. Great tutorial. Now to start searching thrift stores for hankies, tea towels, napkins, etc to transform into pillows. Thanks for your wisdom and sharing. I love your blue checked chairs! Great tutorial….I inherited some dresser scarves, table runner. I need to get moving and make pillows out of them or perhaps even tea towels. So sweet ! I’m hoping to interest my granddaughters in learning similar handwork, like that I did over 50 years ago. Lovely!! I have some old pieces of embroidery, you inspired me to put some pillows together!! Thanks! Anita, Thank you for the clear instructions. I have pieces I can use this idea for! Thank you I love this. May I share? Thank you for doing an envelope back on this! 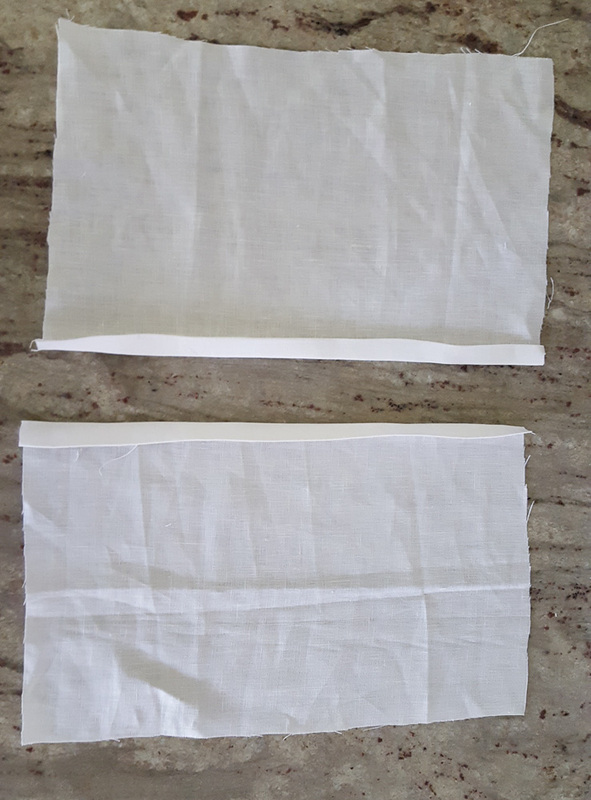 I believe that pillows should be washed occasionally and if you don’t want to do a zipper, an envelope back works great. Beautiful! I have pillow cases handed down by my grandmother from her wedding day that have never been used. This project would be perfect for them. Thank you for the idea! Great post. It brings back memories of my mother’s embroidery. As so many others have said – this is such a wonderful way to use the linens that are just tucked in drawers! 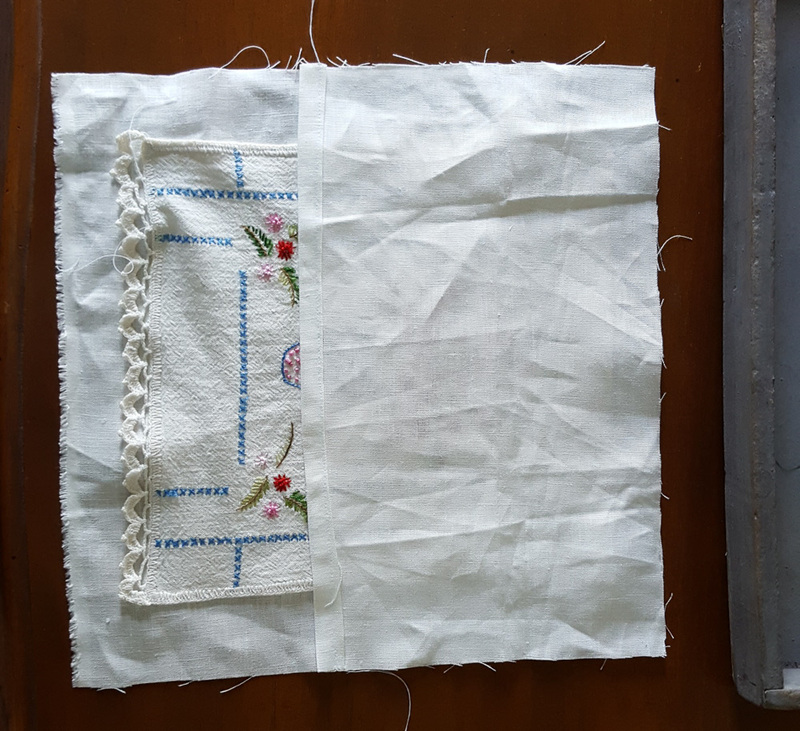 This is my weekend project – and I will be able to see my grandmother’s handiwork everyday! Thank you, Anita! Very cute! I have some vintage bluebird dresser scarves turned into pillows and the back of it is made up of blue Chenille bedspread. I really like that sweet look! Thank you so much! I, too, have many of my grandmother’s and mother’s doilies, scarves embroidered dishcloths and hankies and intend to make these pillows for my own house and to give as gifts to my family as keepsakes. I love the towel you used. 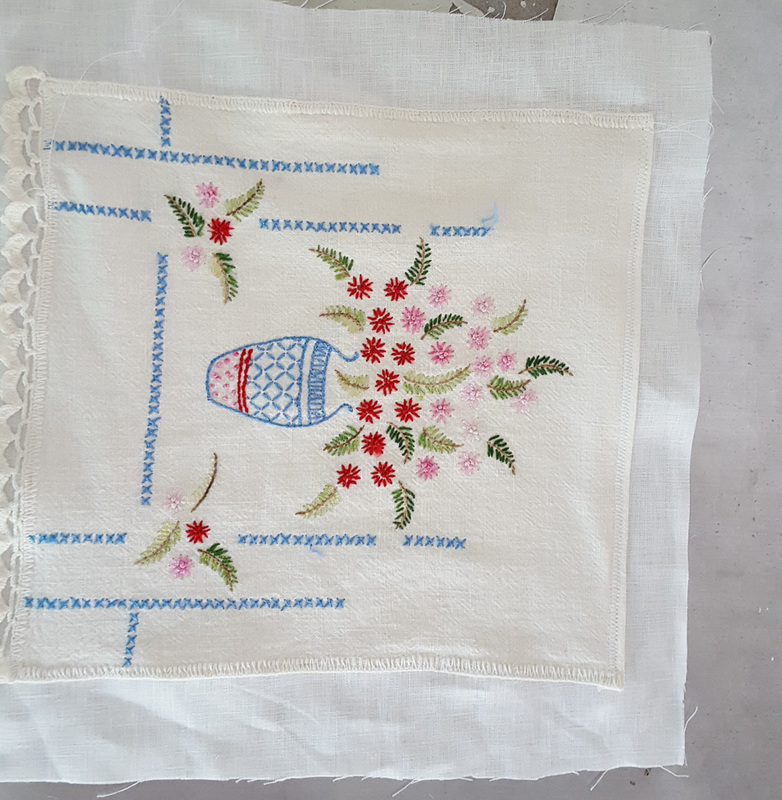 It is a beautiful piece of embroidery work. So nice to find a way to use it longer. After my mother in law died I made pillow covers from her shirts. That way we can still give her a hug. The shirts smelled like her and it brought back many memories. I have a lot of embroidered samplers that I have stitched myself, just waiting for a project like this! Thanks! I have a hard time cutting my grandmothers embroidered items up. But I love this idea, so I’m heading for my scissors as we speak. Great idea for some of the hand me down vintage linens I have. 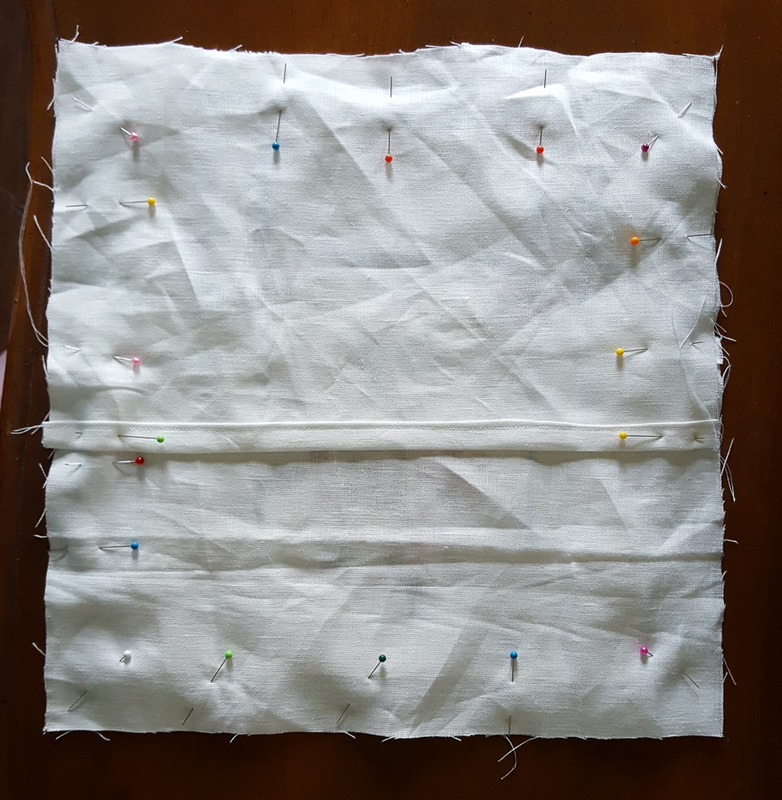 And thanks for the tutorial, I love the fact that it’s a pillow cover and can make several to change out. Anita, I love the pillow. What a grand idea, and to be able to utilize those great embroidered pieces left by our grandparents. Love it. Thanks for sharing. I am just getting acquainted with a sewing machine and I think I can manage making one of these with your easy directions! 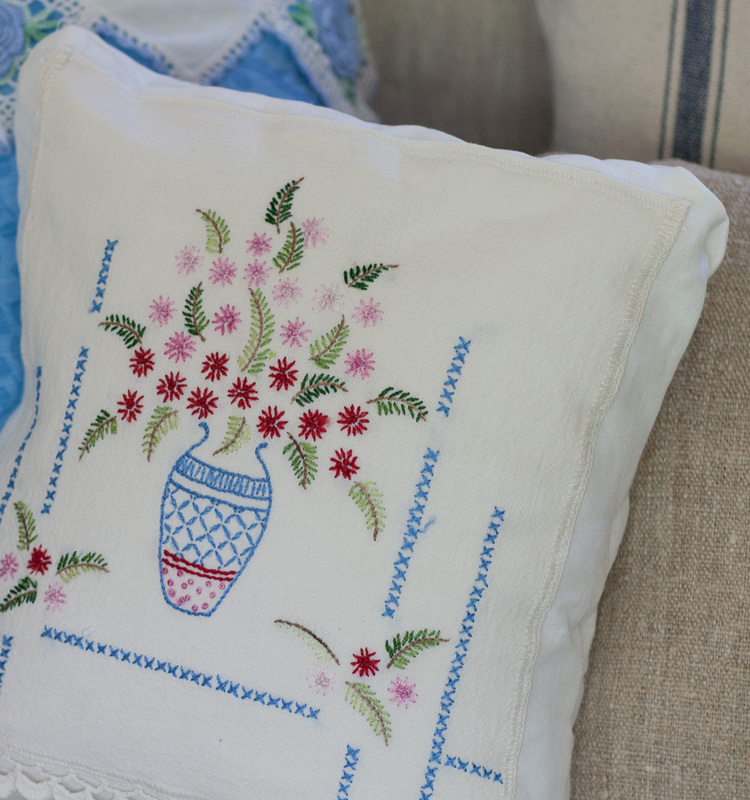 I wish I had all of my grandmother’s embroidered pillowcases but unfortunately, I have only a few. Jane, you will love it! 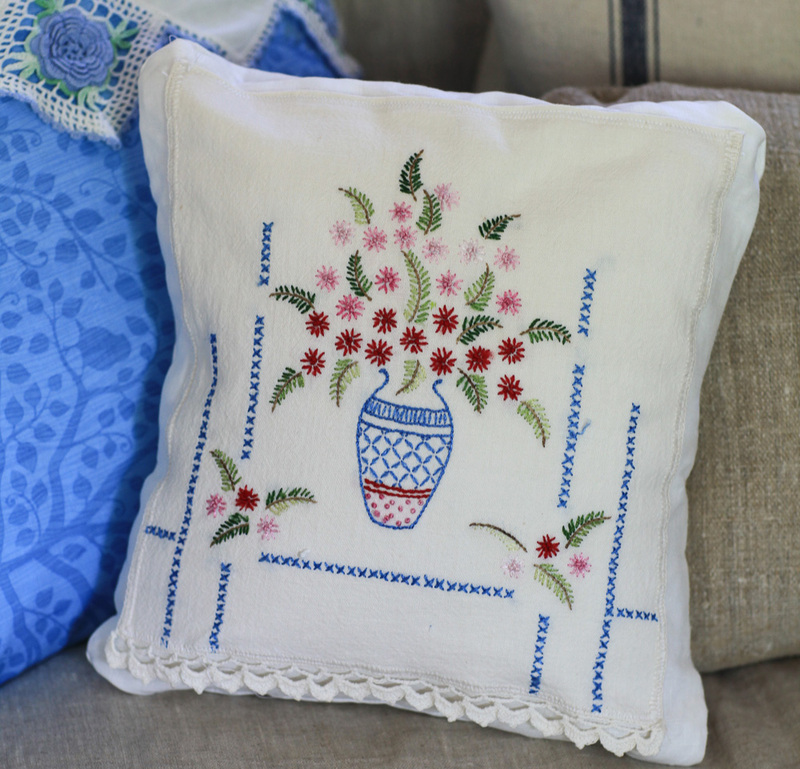 THE best use for vintage guest towels, which often have the best embroidery! Fantastic idea, I have several pieces I could use to make custom pillows with, thanks so much for your creativity. Can you email me your tutorial on how to make fleece throw. I have tried to find it on all of your segments but have not had any luck! Nancy, I don’t have a tutorial for a fleece throw. Great job! Love that you left the lace trim at the bottom. Gives an element of added interest. Visiting from Monday Funday party. So very special, as you said nobody else will have one, love that. I love to buy old dresser scarves to make pillow covers with, Depending on size of scarf use pillow form to coincide with size. Usually hand sew pillow cover around the pillow form. Sometimes I make cover as you did, hate to cut any lace. Those are some of my favorite pillows. Wanted to ask you what kind of fabric you used for rest of pillow cover you made? To me those are very special pillow covers. Thank you, this is such a great way I can display my grandmother’s embroidery! 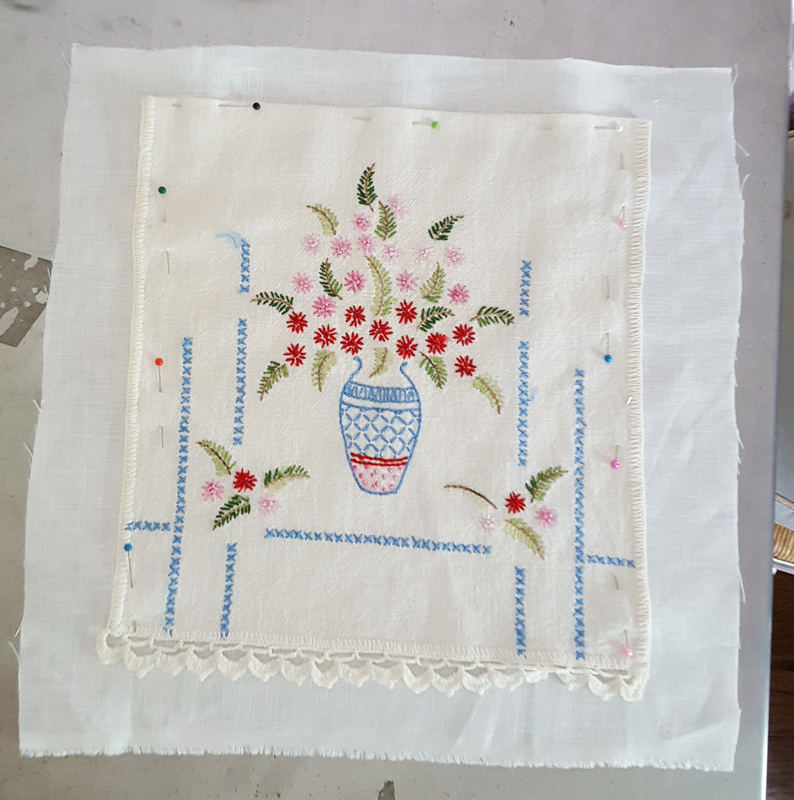 I have been saving scraps of embroidered items for years as I could not bear to throw away all of the lovely work that individuals toiled over, just because the rest of the item was frayed or full of holes. My goal is to turn these scraps into various sized pillow for my front porch swing and wicker chairs. Thank you so much for the inspiration and motivation! So cute! Thank you for linking up with us at #HomeMattersParty .See you again next week.